The Trustees collections span five centuries and include materials that we continue to collect and create today. We are dedicated to preserving the history of each property, from its beginnings to the present day, as well as the history and growth of The Trustees as a leader in the land trust movement. These stories are told through diaries, photographs, maps, furniture, botanical specimens, legal documents, and books, among other items. 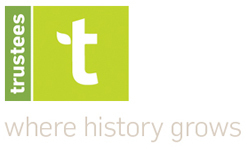 Our history contains the institutional archives of The Trustees, which date back to the creation of The Trustees and contain more than 125 years of history. The collections document the evolution of the land trust movement and the effort to save landmarks and landscapes in Massachusetts. This material includes Trustees publications; uniforms and logos; the scrapbook of our founder, Charles Eliot; and documents pertaining to the acquisition of our properties and conservation restrictions. Our historic collections contain materials from the families and properties before the land was given to The Trustees. They document American life from the 17th to 21st centuries through letters, photo albums, business ledgers, and other materials. Blueprints, planting lists, order forms, and design sketches provide insight on how some of our properties became the special places they are today. The stewardship collections document the maintenance of a property after it has been acquired by The Trustees. These collections grow each year as we continue to care for our properties. Stewardship materials include management plans, event photographs, and trail maps, among other items. When The Trustees acquires a property, we receive its accompanying objects, such as furniture from a house, farming tools once used on the property, or fine art depicting the former residents. Our curatorial collections contain more than 30,000 objects and historic interiors that belonged to the people and places of our properties. The Trustees’ object collections include archaeological artifacts, domestic furnishings, ephemera, outdoor sculptures and fine and decorative arts. For more information on using the online catalog, please see our search tips. To see any of our collection materials in person, please contact the ARC to schedule an appointment.